This salad was made using roasted beets and a bunch of leftovers we had in the fridge like parsley, tomatoes, orange pepper, cucumbers and dried cranberries. The rice was cooked in water and herbs. We often replace some of the water with orange juice when cooking rice. It adds flavour and colour to make it more interesting. The beets take about 1 and a half hours to roast so we had made them the night before. They add colour and a very earthy flavour to any salad. Just make sure you wear gloves when peeling and cutting them. If not, you will have pink hands for a few days. 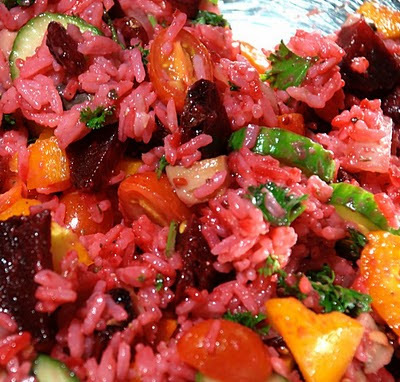 This salad can be made using any leftover vegetables with either rice, couscous or quinoa. We never make the same salad twice.